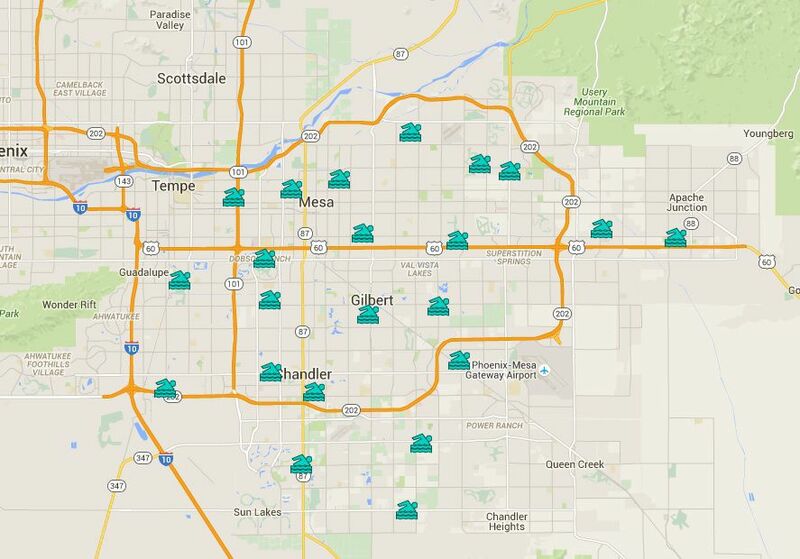 There are 22 public swimming pools in the East Valley of the Phoenix metro area. Those cities and towns that have pools in the East Valley are Apache Junction, Chandler, Gilbert, Mesa and Tempe. You can see these locations marked on a Google map. In the left pane of the map, you can click on the down arrow next to "All Items" and see the list. Click on the one that interests you to see the address and phone number, or find a location on the map to see the details. From there you can zoom in and out, and see what else is nearby. There are 10 public swimming pools in the West Valley of the Phoenix metro area. Those cities and towns that have pools in the West Valley are Buckeye, Goodyear, Litchfield Park, Glendale, Peoria and Surprise. There are 29 public swimming pools in City of Phoenix. There are four public swimming pools in Scottsdale. There are three public swimming pools in Pinal County, not far for some who live in the Phoenix area. Pinal County is actually part of Greater Phoenix, according to the U.S. Census. Gila Bend is in Maricopa County. Visiting Gilbert? Let's Go Shopping.